Our overnight selfies arrived at Tate today before we did. 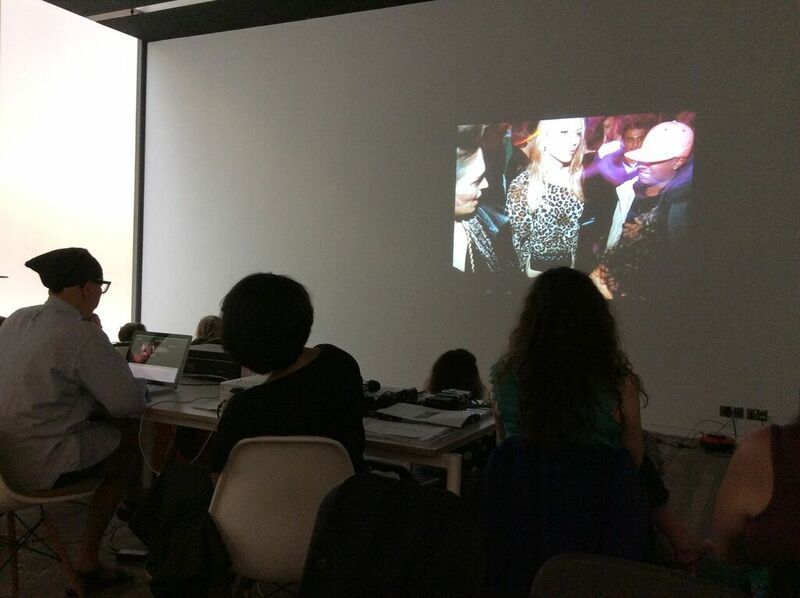 By the time we walked into the Clore studio they had already been put into a slide show. When the workshop began we were introduced to the photographer Christa Holka. As each of our selfies were shown she asked us to say what our intention had been. She then showed us a slideshow of her own work which not only revealed how her focus had changed over time, but also the breadth of work that she now does as a professional photographer. Images of the London gay club and party scene morphed into portraits, set pieces and more commercial assignments – all of them however had a person or group at their centre. Christa talked about the importance of relationships between the person behind the camera and those having their image recorded. Much of her own portraiture work is taken on ordinary cameras – these days her phone – and she does not do a great deal of editing. Her advice to us was not to worry so much about the equipment, but just “use what you have”. We then went into the gallery in groups of five. Each group member separately chose an image they liked, and decided how to physically re-present it. We reassembled as a group of five and put our embodied ‘poses’ together into a single composition – a group self portrait. This group selfie was then photographed either by one of the Tate schools and teachers team or by a member of the public dragooned in for the purpose. 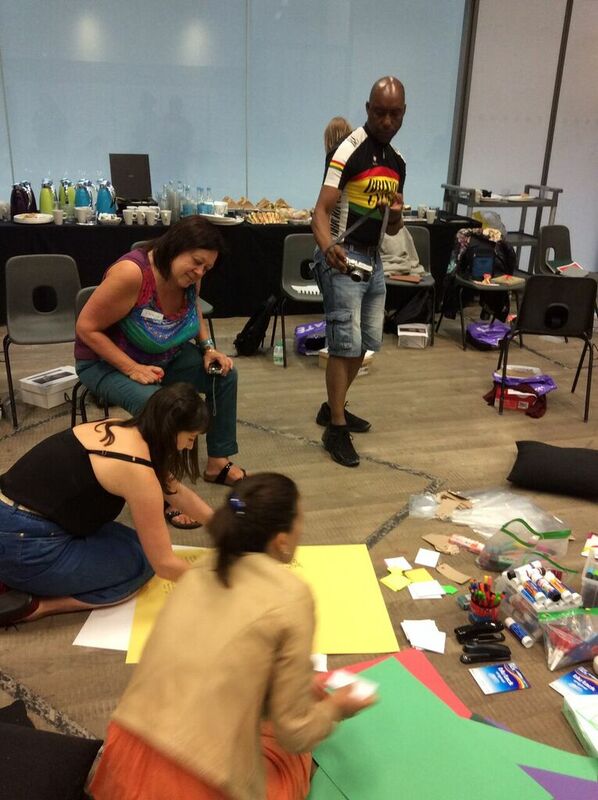 This first sequence of self-portrait activities clearly had a connection with one of the workshop questions, putting ourselves at the centre of making/sharing. And there was a discussion about collaboration to complete the sequence where participants talked about the ways in which collaborative work was and wasn’t possible in their work settings – the English national curriculum came in for a bit of criticism. The focus on making ourselves the centre of the action was extended in the afternoon by the next activity sequence. We began to work on an archive related to the summer school. First of all, in the same group of five as the morning, we had a brief discussion about the possibilities of and for archiving. We came up with some parameters for a collective Summer School archive. 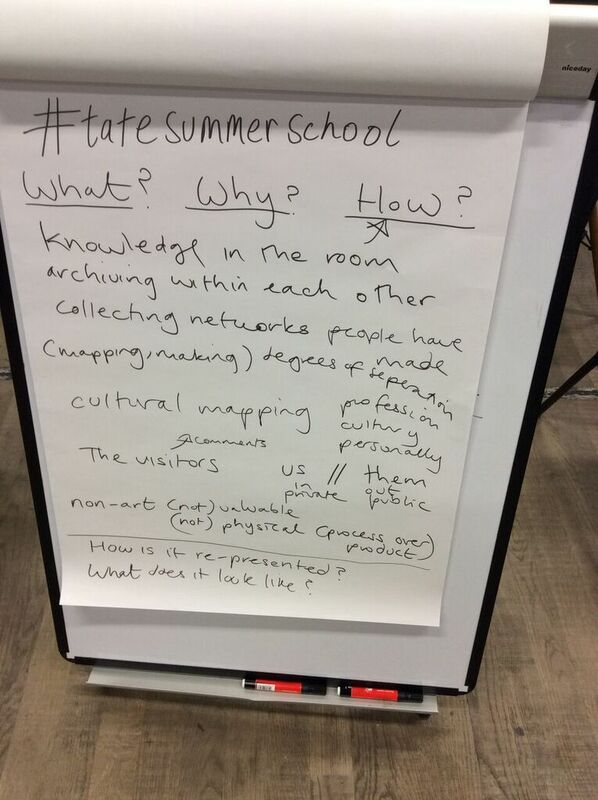 There is, we were told, a possibility that the school could actually be archived at Tate in some way, so this is not simply a make-believe exercise. Barby and Teresa are documenting the archiving process so we assume that this will also contribute to the overall archive we are making – and indeed being. Most of the afternoon was then spent with small groups or individuals making something to deposit into the archive. Each item had to be logged. 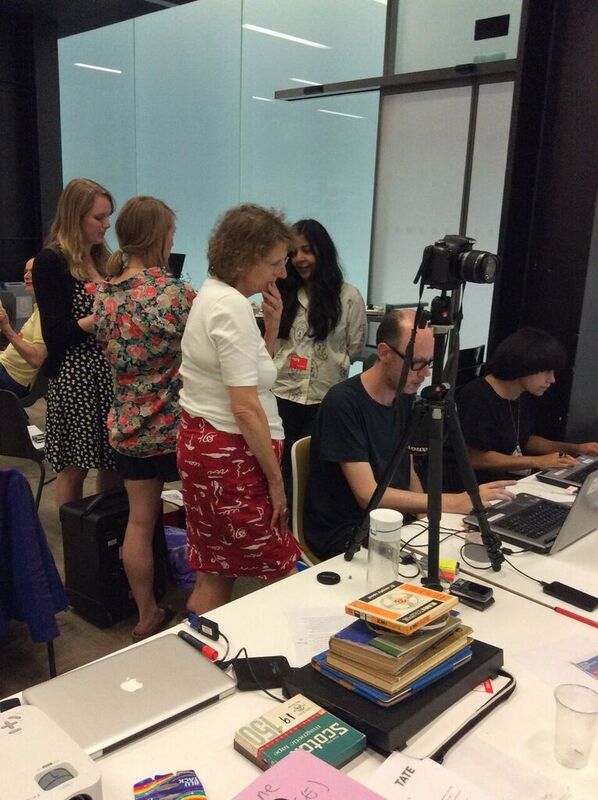 The day ended with each person or group showing what they had produced for the archive. (1) videos with cold-called members of the public, objects they had donated or a quote they offered. (2) An 18 minute ‘live art’ piece performed by one participant walking through the gallery dressed in her swimming costume. 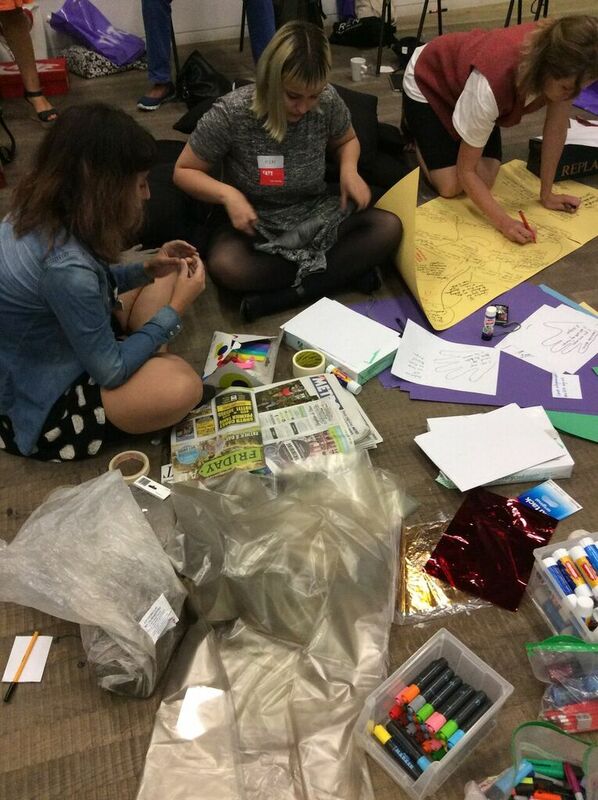 (12) Tracings of hands and representations of hands of random Tate visitors and workshop participants. At the end of the day the studio at Tate Modern was cleared out as tomorrow we move to Tate Britain. This entry was posted in Tate Summer School and tagged Pat Thomson, Tate Summer School. Bookmark the permalink.